Below are a few cold weather safety tips to keep you and your home secure from Frosty’s frigid touch. If you haven’t already winterized your home, then now is a good time to do it. Add extra insulation in your attic and walls, if possible. Caulk around windows and doorframes to keep the warm air in and the cold air out. In case your power goes out, you want to be sure you’re prepared to brave the cold weather for a few days. You’ll want a backup heat source, such as a generator or wood-burning fireplace. You’ll also need at least a three-day supply of water, non-perishable food items, flashlights with extra batteries, battery-powered cell phone chargers and a medical kit that includes prescriptions. Make sure you’ve replaced the batteries in your smoke and carbon monoxide detectors. While turning on your heater will probably be fine, you should take extra precautions since it probably hasn’t been fired up for months. Also, be extremely careful with space heaters. Make sure they’re away from anything flammable, and always turn them off before you go to sleep. Frozen pipes are costly to fix. Your pipes can freeze and cause water damage when they thaw. And, not being able to access clean water can be major inconvenience. To prevent frozen water, keep your home at a constant temperature day and night. If the power goes out, turn your faucets on to get a small trickle and open up all the cabinets to circulate warm air around the pipes. Don’t let a snow or ice storm catch you unprepared! From survival storage to heating your home, the better you equip your house now to handle the cold weather, the less you’ll have to worry about when the power goes out. 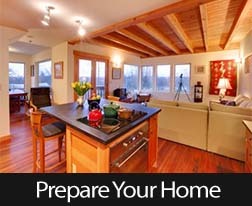 Utilize the safety tips above to get your family and your home ready for whatever winter might blow at it. For more around the home tips or how to stay warm in a new home this winter, contact your trusted real estate professional.